This week’s featured post: “Don’t Means-Test Medicare“. Because the first step in gutting a program is to get the rich people out of it. Little by little, the Republicans are realizing that the shutdown battle isn’t Mr. Smith Goes to Washington, it’s “The Ransom of Red Chief“. The longer this hostage crisis goes on, the more painful it is for them. Wednesday Gallup showed the Republican Party with a 28% approval rating, down ten points from the previous month, and even lower than the 31% nadir they hit during the Clinton impeachment. Thursday, an NBC/WSJ poll said that the public blames them for the shutdown (53%-31%), while both President Obama and the Affordable Care Act have become more popular. The public says (47%-39%) that it wants to see a Democratic Congress in 2014. To me, the most damaging result was Question 16. Asked whether President Obama was being a strong leader or putting politics ahead of what’s good for the country, the public was mildly negative (46%-51%). But the same question about congressional Republicans produced a landslide: 70% said Republicans were putting politics first. It is not in the best interest of the employers, employees or the American people to risk a government shutdown that will be economically disruptive and create even more uncertainties for the U.S. economy. Likewise, we respectfully urge the Congress to raise the debt ceiling in a timely manner and remove any threat to the full faith and credit of the United States government. Failing to raise the debt ceiling in time would be an unprecedented mistake. … To use a credit card analogy, the decision about what to buy on credit tomorrow must take into account the debt we already owe, but that is never an excuse for not paying the current bill on time and in full. Even the Koch brothers started pulling back (after spending an estimated quarter-billion dollars on groups that promoted this crisis). Wednesday Koch Industries sent a letter to all senators denying that they had a position on the shutdown. But the idea of ransom wasn’t gone. In exchange for a six-week extension on the debt ceiling (and not re-opening the government), Ryan wanted to replace the sequester cuts (which originally were designed to be equally offensive to both parties, but which the Republicans are happier about than the Democrats) with cuts to Social Security and Medicare. So: we’ll let the hostages live another six weeks if you give us something. President Obama wasn’t interested. Then over the weekend the Senate tried to work something out, again with smaller ransom demands. Senator Susan Collins (R-Maine) proposed to extend the debt ceiling through January and fund the government through March. In exchange she wants some lesser changes to ObamaCare (repealing or delaying the medical device tax, plus making some changes to eligibility which I can’t find spelled out anywhere). The problem here is that that new sequester cuts go into effect in January. What the Democrats hoped to accomplish in budget negotiations was to avoid some of those cuts. That’s why the continuing resolutions they supported accepted Republican-supported spending levels, but ended before January 1. Senate Democrats view a CR that lasts until March as a concession. And what they get in exchange for that concession is to let the Republicans out of the box they voluntarily got into. The stock market seems edgy (down 75 when I last checked) but not panicking. Debt-ceiling disaster is scheduled for Thursday. 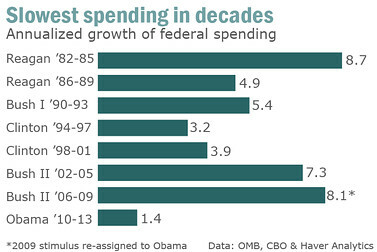 Conservatives are still telling each other than “Obama will blink” if they push this to the edge. As has been true from the beginning, the pundits keep telling us something will work out, but they’re not sure what the deal will be and they have no scenario in mind for how it happens. I’m making no predictions. When you push important stuff off to the last minute, sometimes it doesn’t get done, even if you really intended to do it. The funniest commentary on the shutdown came from The Daily Show’s Jason Jones. He decided to take the ransom metaphor literally and seek advice from a professional hostage negotiator. Why do people take hostages? Jones asks. Negotiator: In their world, they’ve tried a lot of other things, and everything they’ve tried up to that point has failed. They view themselves as extremely significant people, so they’re mystified that they’re not being followed more. And they’re hurt by it and they feel very abandoned by it. Jones: You know, I thought calling in a hostage negotiator would kind of be funny, a funny joke, but it’s kind of incredible how this metaphor is lining up. Negotiator: Even batshit insane has its own rules. My takeaways: Tea Partiers and Evangelicals together make a majority of Republicans, and while they disagree on the importance of social issues, they share an apocalyptic feeling that the country may slip away from them for good unless they take drastic action now. They’re scary that way. It’s a little bubble. So everybody – it’s like a Lake Wobegon. Everybody is above average. Everybody is happy. Everybody is white. Everybody is middle class, whether or not they really are. Everybody looks that way. Everybody goes to the same pool. Everybody goes – there’s one library, one post office. Very homogenous. Obama has extended a new entitlement to create a class of lazy, poor voters whose well-being is dependent upon the Democratic Party. there is still something well-nigh-unprecedented about how Republicans have conducted themselves of late. It’s not the scale of their mistake, or the kind of damage that it’s caused, but the fact that their strategy was such self-evident folly, so transparently devoid of any method whatsoever. A Methodist pastor examines the Dominionist theology that justifies tactics like the shutdown. Political historian Rick Perlstein has been doing an eye-opening series “Thinking Like a Conservative”. Parts 1, 2, 3, and 4. Whenever an exasperated liberal points out that the basic architecture of the Affordable Care Act matches a plan drawn up by the Heritage Foundation in the 1990s, I feel a stab of exasperation myself—with my side. Theirs is not a clinching argument, or even a good argument. It means nothing to point out to conservatives that Heritage once proposed something like Obamacare. The Heritage plan was a tactic of a moment—a moment that required something to fill in the space to the right of President Clinton’s healthcare plan, an increment toward the real strategic goal of getting the government out of the healthcare business altogether… someday. The Ride for the U. S. Constitution was a vision that would put the fear of God into those corrupt left-wing politicians: ten thousand truckers shutting down the Washington beltway for the whole Columbus Day weekend, then delivering their list of demands to a sympathetic congressman, Louis Gohmert of Texas. Or maybe it would be “hundreds of thousands of truckers and millions of citizens“. They’d convene a citizens’ grand jury (a.k.a. a lynch mob) to indict and arrest “everyone in government who has violated their oath of office” — Obama, certainly, but also Nancy Pelosi and Dianne Feinstein, among others. They wouldn’t rely on the lamestream media to spread the word (well, except for Fox News, where Megan Kelly gave them five minutes of air time; independent media magnate Glenn Beck also pushed their cause). They’d do their own viral messaging through Facebook, Twitter, and plain old fliers posted at truck stops. The People would speak so loudly that no one could ignore them! Of course, in America we have this other way for the People to speak: elections. We just had one last year, and President Obama was re-elected by almost five million votes. It’s not a perfect institution — Republicans retained control of the House of Representatives in spite of getting 1.3 million fewer votes than the Democrats (spreadsheet) — but it’s been working reasonably well ever since it was established in … well, it’s in that Constitution they’re riding for, isn’t it? But if the People want to speak some other way too, that’s fine with me. (Well, other than that lynch mob thing.) So how many truckers turned out? About 30. I haven’t heard how the arrest of Nancy Pelosi went. Crap! I don’t know what’s wrong with these charts. What if we measure the size of government in employees? Then we’ll really see how out of control the octopus is. (The peak in 2010 was for temporary census workers.) 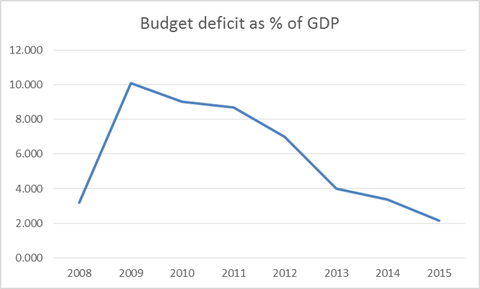 OK, but the deficit — we know that’s going through the roof. That’s what justifies the Tea Party’s hostage-taking tactics: If we don’t get control of the deficit now, our children will be debt slaves of the Chinese! Ah, screw the data. We’re just mad as hell and we’re not going to take it any more, whatever it is. 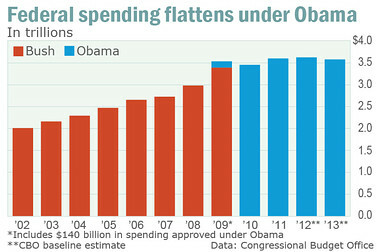 As Congress move towards actual budget negotiations, we can expect to hear a lot of hysteria about the national debt. An opening shot was Niall Ferguson’s WSJ op-ed. Economist Brad DeLong explains why Ferguson is peddling complete nonsense. the problem is that there hadn’t been that much activity with voter identification. Maybe we should have been more imaginative….We weren’t really given strong indications that requiring additional voter identification would actually disfranchise people entitled to vote. … I don’t think we had enough information. Unfortunately, the Supreme Court followed him down that path 6-3. Meanwhile, Kansas and Arizona are planning a new tactic: second-class voters. A Supreme Court ruling against an Arizona law requiring voters to show proof of citizenship apparently applies only to federal elections. So if states split elections into a federal ballot and a state/local ballot, maybe they could give only the federal ballot to voters who haven’t shown proof of citizenship. At least the Supremes haven’t said otherwise yet, so it’s worth a try. I explained my take on voter suppression two weeks ago: The Republicans have given up on convincing a majority of the American people to agree with them, and are now focused on tactics that allow them to govern from the minority. Voter suppression, gerrymandering, the filibuster, the Hastert Rule, blocking a path to citizenship in any immigration reform, the congressional hostage-crisis we’re in the middle of now … it’s all part of the larger plan for minority rule. For some reason out in the heartland in the middle of Texas, really powerful people coalesced around this notion that Kennedy was a traitor and in fact was guilty of treason. And these weren’t just folks who were idly thinking these thoughts; they were acting on them and forming organizations and movements to essentially overthrow Kennedy. … He was perceived to be a traitor. He was a socialist, he was on bended knee to so many different entities — communism, socialism and even the pope. We look back at that now and say, “Those people were crazy.” Today, not even the Tea Party (at least not most of it) claims that JFK was a traitor or a Communist, or that we can’t have a Catholic president because he’ll take orders from the Pope. But they don’t see the connection between that craziness and what they are saying about Obama today. I do my best to keep errors of fact off the letters page; when one does run, a correction is published. Saying “there’s no sign humans have caused climate change” is not stating an opinion, it’s asserting a factual inaccuracy. Hey, interns: Now you can be sexually harassed while you work for no pay. Is this a great country or what? In your list of methods the GOP are employing to rule from the minority you forgot one — Repeal the Seventeenth Amendment. I keep forgetting that one. I doubt they’ll succeed on it, though. And another takeover method they’ve been more successful with: the recall. In Colorado they’ve successfully recalled two Democratic state senators and replaced them with GOP, and are trying for a third to take the majority in the state senate.